A.Gritton Garden Services - Fencing/Gates, Landscaper based in Gislingham, Suffolk. 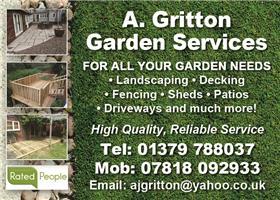 A.Gritton Garden Services are a family run business based just outside of Eye in Suffolk. Taking great pride in our work, we offer a bespoke product that is right for you. We have established a highly satisfied customer base due to our friendly and professional service, bespoke work, fair pricing and the high quality finish provided. All of our materials are from quality, local suppliers. We also have full liability insurance for peace of mind. Take a look at our photo gallery to see examples of the work we do. For a free, no obligation quote please give us a call.